Next month's program is to be announced! Stay tuned for more details. Past presentations, and occasionally future, can be viewed here. Check out Bill Priedhorsky's profile on the LANL web page! Future Club Speakers: In addition to frequent presentations by nationally known adventurers, we love to hear from our own members....not that some of you aren't in that group. A presentation gets you a free club membership and dinner at the restaurant of your choice in Los Alamos. LAM Member Presentations Wanted! The LAM Board would like to encourage our members to provide more of our monthly presentations. We understand well that club members are an active lot, with a wealth of activities in their repertoire that can and have been inspiring to new and old members alike. We have often focused our monthly presentations on the elite of the outdoor adventure world, and perhaps created the undesired effect of squelching the voices of our own members who participate in frequent beautiful and exciting adventures of their own. Although our own activities are not always "world class", they are representative of what we "weekend" athletes can and do accomplish. We want many of our programs to inspire the "I can do that" attitude in our members, not merely entertain. Shock and awe may have their rightful place, but inspiration to participate and shine is our true goal. Trip Leaders: Post your trip by logging in and then going here. If you do not have an account, contact the webmaster. For overnight trips, please ensure that membership waivers for participants are current and recorded by the club Membership Chairperson prior to your trip. Non-members may participate in day trips. All club sponsored trips require the trip waiver. After the trip, please scan and email a PDF of the waiver to the Trip Coordinator. 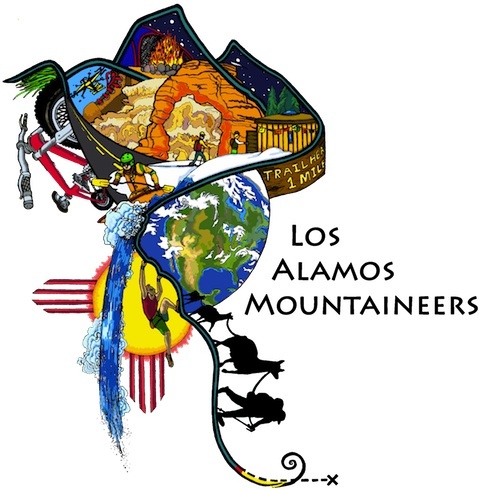 GMRS / FRS Radio Usage on Club Trips: The Los Alamos Mountaineers encourage you to carry portable "family" radios as a safety measure on appropriate LAM trips, and urge participants to agree on a contact channel at the beginning of the trip. As a default, if no channel has been selected, LAM suggests channel 3.14. These three first digits of "pi" might be easily remembered in this scientific community. Borrow Equipment: We have a limited amount of mountaineering equipment for loan (e.g., avalanche transceivers). Contact our Equipment Manager listed on this page. The 2019 Climbing School will start May 1, 2019. Course Objectives: Beginner through intermediate students will learn the fundamentals of single-pitch rock climbing. The five-week course, taught by an AMGA certified Single-Pitch Instructor, will cover fundamentals of top-roping, anchor building, climbing technique & movement, rappel, and sport lead climbing. Students will be required to provide a minimum amount of climbing equipment (see Minimum Equipment Requirements). This equipment is necessary to participate in the class, and detailed instruction will be provided throughout the course. The combination of selected equipment and course instruction are tailored to meet all current climbing-industry standards and best practices, and will prepare students to participate in LAM single-pitch outings in the Northern New Mexico area. The class fills quickly with only 24 seats, so early registration is recommended. Trip Leaders: Anyone can lead a trip! Post your trip by logging in and then going here. If you do not have an account, contact the webmaster. For overnight trips, please ensure that membership waivers for participants are current and recorded by the club Membership Chairperson prior to your trip. Non-members may participate in day trips. All club sponsored trips require the trip waiver. After the trip, please scan and email a PDF of the waiver to the Trip Coordinator. This trip is currently full. I'll put your name on a waitlist if you wish. Where: Pajarito Gorge. Trailhead is at the end of Kimberley Lane in White Rock. Parking is limited, so carpool if you can. When: 4/27/19, 9am - early afternoon, depending on speed we can move the group through the canyon. We will combine a trip down the non-technical portion of Escobas Canyon (one of my local favorites) with a discussion (before departing) on the requirements to put a trip together and lead a trip. This is a largely off-trail excursion and will likely have you out for 4-6 hours. I have not been down the water course for a while and I'm not sure what shape it's in. However, I am confident that there will be some bush whacking, and you will want to dress in long pants and have a long sleeve shirt available. Bring lunch snacks and enough water for a day out. Where: The southeast corner of the Taos Walmart parking lot, 926 Paseo Del Pueblo Sur, Taos, NM 87571, USA. Parking at the trailhead is limited and there is a fee per car, so carpool if you can. We'll further load cars at the Walmart. When: 5/11/19, 10am (at Taos Walmart) - early afternoon, depending on speed we can move the group through the canyon. We will plan to camp near Willow Lake in the Western drainage of the Crestones, below Kit Carson Peak. 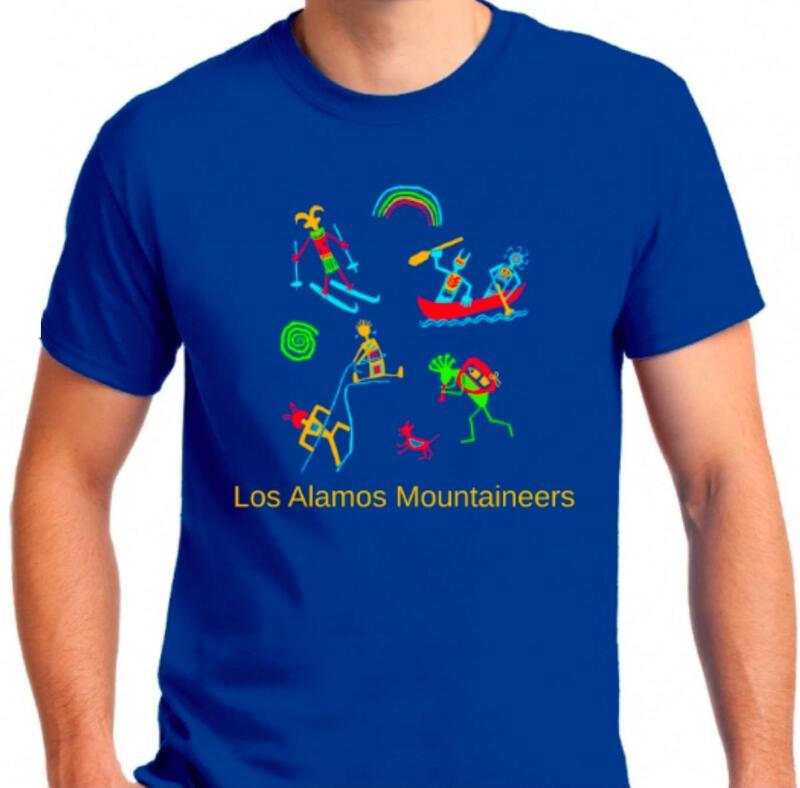 On Friday May 17tth we will drive from Los Alamos to Crestone, Co., departing around 09:00 with an anticipated arrival in Crestone of around 12:30. From there we will shoulder our backpacks and climb the 2850' in 41/4 miles to Willow Lk and set up camp. On Saturday, those interested can make a go at Kit Carson, or simply enjoy the day exploring the cirque. All my prior trips into the Crestones have been from the other side of the ridge (via S.Colony Lakes).